Just when 12″ fans thought there was nothing new to look forward to, along comes the GIjOE Collector’s Club (GIJCC) and their new membership exclusive dubbed the “Comrade of Action” (COA). 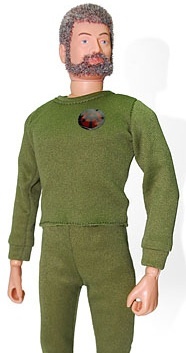 Sneak preview pics recently released by the club show the base COA figure will include a foreign headsculpt “fuzzhead” Joe with Kung-Fu Grip and a nifty set of OD long underwear. 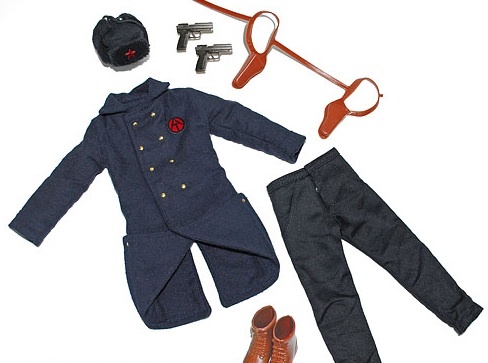 But the REAL fun begins when you outfit this new figure in his exclusive uniform accessory set (sold separately, as it should be). Fully outfitted, this prototype of the club’s upcoming “Comrade of Action” stands ready for action! (Photo: GIJCC) Click to enlarge. We really like this set’s new dark blue Russian longcoat, complete with 10 brass button “snaps,” and two fold-up leg flaps. Its unique styling gives the figure a definite “foreign” look. There’s also a cool “double-rig” holster for carrying the COA’s twin pistols, a pair of matching pants, brown short boots and a matching blue version of the famous fuzzy Russian winter hat. It’s easy to imagine adding additional accessories such as a Kalishnakov or AK-47 sub-machinegun, maybe some hand grenades, etc. ROCK ON, Nicholai! Bottom line: This new club exclusive arrives at a time when little else is being offered for collectors and fans of 12″ GIjOEs. As Hasbro continues moving away from its iconic 1:6 scale action figure, fans will surely appreciate this admirable effort by the club. 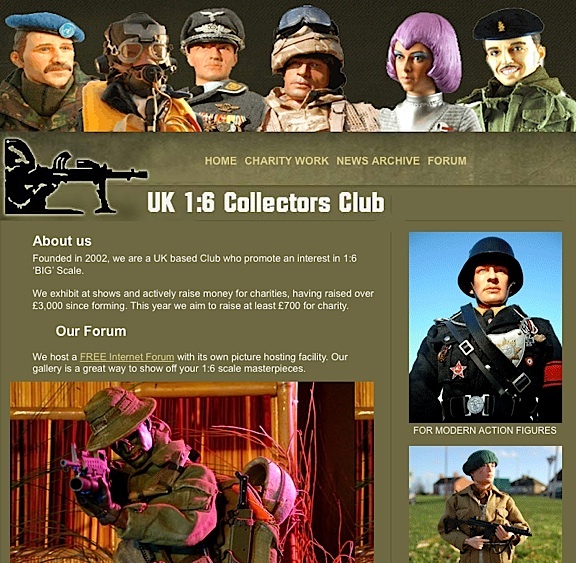 A screenshot of the UK 1:6 Collector’s Club forum homepage taken February, 2013. “I would like to send out a formal invitation to all members here, (those who aren’t already that is) to drop over to the One Sixth UK forum, and join the party! Over there, there is no “bad blood,” there are no politics from the old days. I believe I can say without contradiction that each and every member there absolutely loves it! It’s like the forums of old, where everyone congregates to see what has been posted, to see reviews of the latest release from DML, DiD, Hot toys etc. It’s the place to be for UK, European and worldwide members! Bottom Line: It’s always a sad day when any fan forum or collector website shuts down. But it looks like UK fans have matters well in hand. We wish the new “One-Sixth UK Forum” all the best! In this enjoyable video about next month’s Joelanta show in Atlanta, GA, one of the event’s main organizers, Buddy Finethy, of the Atlanta division of the GIjOE Collector’s Club, discusses the latest plans for the event. Full of great “intel” for all Joeheads. Go, Buddy! And GO JOE! This stunning custom USMC GIjOE created by Don Hanke, features a handmade uniform, hand-casted resin helmet, hand-sewn helmet cover, harness and backpack. Only the grenades, belt and rifle are “store-bought” items. (Photo: Mark Otnes) Click to enlarge. “The Battle of Iwo Jima (February 19–March 26, 1945), was a major battle in which the United States Armed Forces fought for and captured the island of Iwo Jima from the Japanese Empire. The American invasion had the goal of capturing the entire island, including its three airfields, to provide a staging area for attacks on the Japanese main islands. This month-long battle included some of the fiercest and bloodiest fighting of the War in the Pacific of WWII. The Imperial Japanese Army positions on the island were heavily fortified, with a dense network of bunkers, hidden artillery positions, and 11 miles of underground tunnels. The Americans on the ground were aided by extensive naval artillery and the U.S. Navy and Marine Corps aviators had complete air supremacy over Iwo Jima from the beginning of the battle. The iconic flag-raising on Mt. 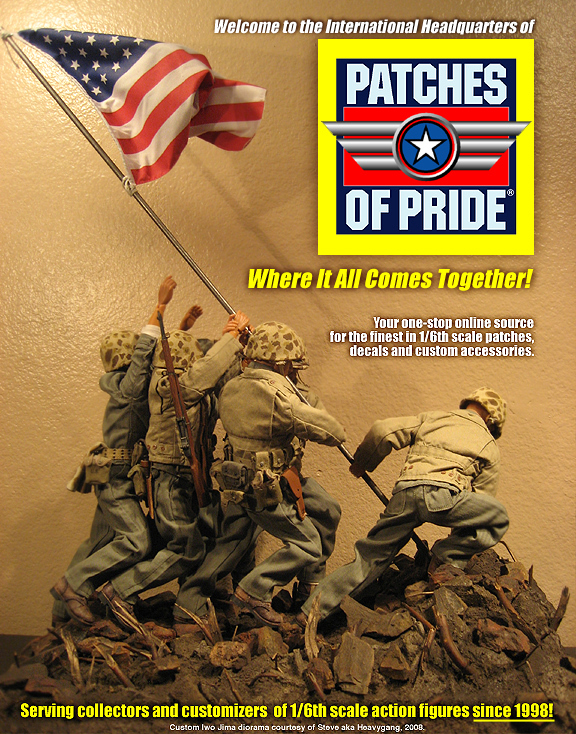 Suribachi by US forces was perfectly captured in this stunning 1:6 scale diorama by “HeavyGang,” currently visible on the homepage of the Patches of Pride website. (Photo: Heavygang) Click to enlarge. American sea power and air power were capable of delivering vast amounts of fire onto the Japanese troops. 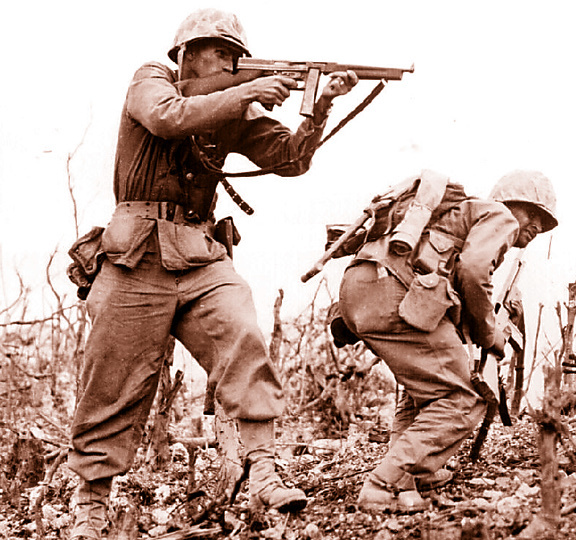 This invasion was the first American attack on Japanese home territory, and the Japanese soldiers and Marines defended their positions tenaciously with no thought of surrender. The Japanese general in charge never considered surrendering to the Americans to save his men, and he and his officers had vowed to fight to the death, no matter how hopeless their battle was. What a difference those three little letters at the end of a URL can make. For GIjOE fans and collectors searching online for information about next month’s big show in Atlanta, GA, the Joelanta.com website abruptly redirects them from the “southern comforts” of Georgia, to, of all places—a baking and desserts website in Japan! 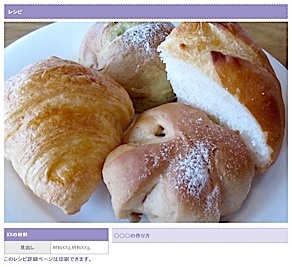 Yes, in some weird, “twist of internet fate,” Joelanta.com has become a Japanese-language website about sweet treats and desserts! 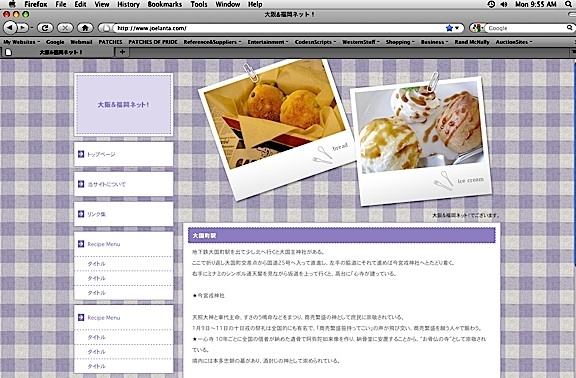 Browsing the site (Mmm…), we discovered lists of recipes (all in Japanese), close-up photos, and links to a great variety of dessert “intel,” but NOTHING about an upcoming GIjOE show in the U.S. For example, “Recipe #2,” found HERE takes wannabe bakers (and hungry Joeheads) to a page describing how to bake mouth-watering rolls and biscuits. Yes, that’s very tasty. But informative about Joelanta? No. Bottom Line: You know, the more we look at Joelanta.com, the more we love those rolls, desserts and ice cream treats. Maybe the two groups could combine forces for some sort of a “Joes & Jelly Doughnuts” show next year? Mmm…Doughnuts… Until such time, don’t forget you can always find delicious 1:6 scale pizza and REAL bread treats for your Joes over on the PoP site HERE. 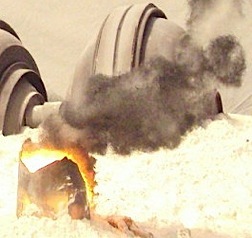 If you’ve ever tried to build an indoor 1:6 scale battlefield diorama for your GIjOEs, then you know how difficult it can be to create realistic flame, smoke or explosion effects. It’s a truly vexing visual problem, one that’s long stumped even the most creative GIjOE fans. Some of us have made flame “plumes” out of sticky, spray foam insulation (a fairly good solution). Others have plumped up wrinkled paper mache´ or cotton balls painted with assorted colors (a so-so solution). And still others have tried to mix blinking colored Christmas tree lights with painted or photographic backgrounds (expensive and unconvincing). But thanks to a couple of talented Star Wars fans, there’s now an easy, vastly superior and highly realistic solution to this problem—and you can do it! You’ll need little to NO artistic talent, and the material costs required are minimal. According to Zipidi Doodah, who also goes by the name, “Barry,” the original credit for this concept should go to its creator, Roberto Williams (Thank you both, Roberto and Barry!). 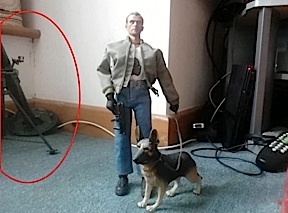 If you decide to utilize any of these great effects in your next GIjOE diorama, please send some photos of your work to us here at The Joe Report, so we can add them to this article and share them with the world. Here’s Barry’s instructional video. Enjoy, and FLAME-ON! “There were five police officers at the door, two of them carrying submachine guns. And they were ready to smash the door open… They had come in search of a deadly mortar tube – spotted in the background of a picture that Mr Driscoll had posted on Facebook. 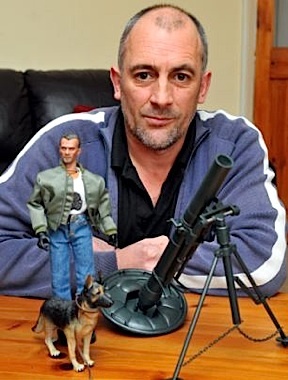 Mr Driscoll, 43, did indeed have a mortar in the home and promptly showed it to the squad. It was a toy. “Laura Timoney went ballistic when she received a call from her son’s school. Staten Island fourth-grader Patrick Timoney was in tears because he was being threatened with a suspension by P.S. 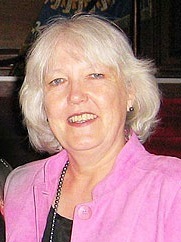 52 principal, Evelyn Matroianni. 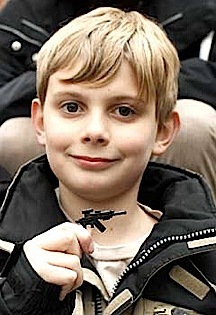 “A British tourist told last night how airport staff seized a 2-inch gun from a toy soldier she was carrying home for her grandson. 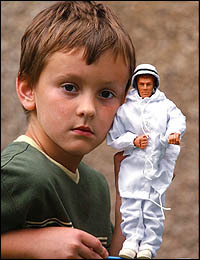 Judy Powell, 55, bought the ‘GI Joe’, a U.S. version of Action Man, during a holiday in America, as a gift for seven-year-old George. But she had not reckoned with the zeal of staff at Los Angeles International Airport. As she prepared to catch her return flight to London she was stopped and searched. 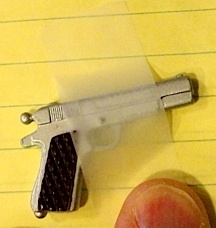 Guards pulled the toy, still in its box, from her hand luggage and relieved it of its tiny replica Armalite rifle. Not content with that, Mrs Powell says, they then asked her if there were any grenades with the toy. ‘I thought they were joking but they were not smiling,’ said Mrs Powell, from Walton on the Hill, Surrey. 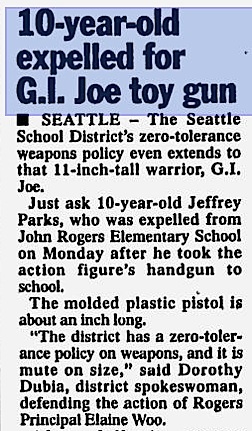 ‘They were deadly serious.’ It has to be questioned, however, how much of a risk an 11-inch GI Joe could pose to U.S. national security. ‘I bought the toy in Las Vegas for my grandson,’ said Mrs Powell. 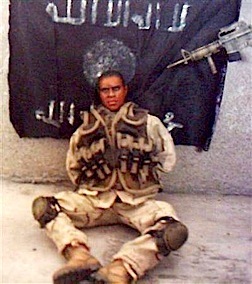 “A photograph of what Islamic militants claimed was a captured U.S. soldier in Iraq turns out to be a toy action figure. 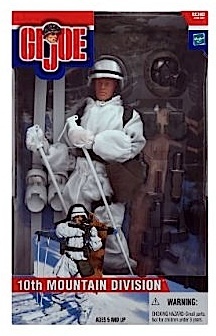 The would-be hostage is better known as “Special Ops Cody,” a military action figure created by Dragon Models USA. 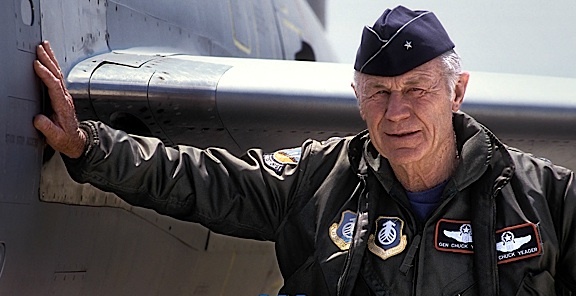 Happy 90th Birthday, General Chuck Yeager! You may also recall how in the wonderful film, “The Right Stuff,” as the fame of the U.S. space program’s “Mercury 7” astronauts grew, press coverage of Yeager’s own accomplishments greatly (and unfairly) diminished. 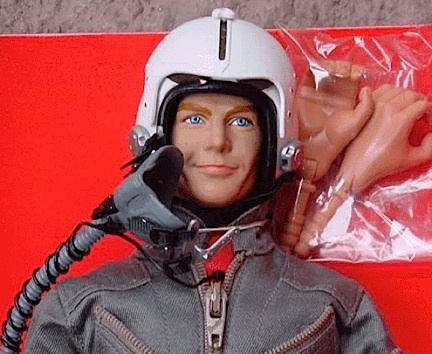 Bottom Line: Despite being largely ignored by action figure companies, General Yeager remains HUGELY popular with aviation and military history buffs. He even has his own website (found HERE), and you can email a personal birthday wish to this amazing man by jumping to THIS PAGE. Some days you just want to go out on the range and shoot at old cars about a half mile away. Watch, as these young British soldiers train to get accustomed to the awesome firepower of the classic American-made Browning .50 cal machine-gun. This short video has great audio and lots of nice closeups of the soldiers, their uniforms and helmets, as well as the weapon and its AWESOME ammo belt feeding out from its ammo box. Toward the end, you can even see some tracer bullets streaking downrange. 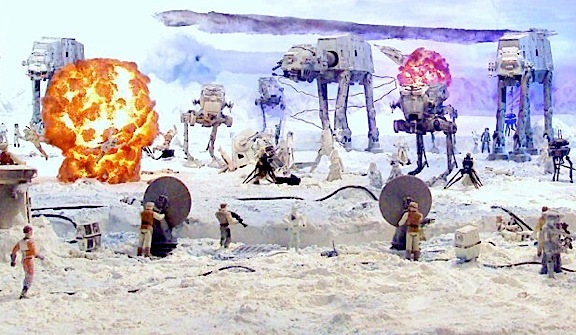 This would make for a great 1:6 scale diorama scene! 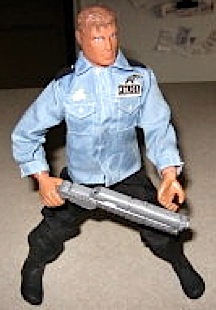 “The DFW GI Joe and Action Figure Show is back for 2013! The members of the Dallas / Fort Worth GI Joe Collectors club are extremely pleased to announce our second official show. Both the attendance and the overwhelming positive response received from the 2012 show far exceeded the clubs expectations, so we figured we’d do it again. So what’s changed? Well, we’re changing our venue and doubling our vendor space. Table cost will be $50 each before September 1st, and will then be $65 after that date. Booths will be $110 for a three table U shape sales area. The booth price will increase to $140 after September 1, 2013. For those of you that are interested in reserving table space you might want to do that sooner rather than later as we’re already starting to receive requests from individuals who want multiple table space/booths and we sold out early for the 2012 show. As the name of the show states, this show is just not solely about GI Joe in his various incarnations or size but about his action figure brethren as well. So, no matter what your taste in action figures you’ll be able to find it at the show. If you have any questions please feel free to E-mail Michael Milstead at milsteaddfwjoe@yahoo.com. If you would like to participate in this show as a vendor please contact Keith Holmes, the show organizer, at showhost@dfwjoe.com. 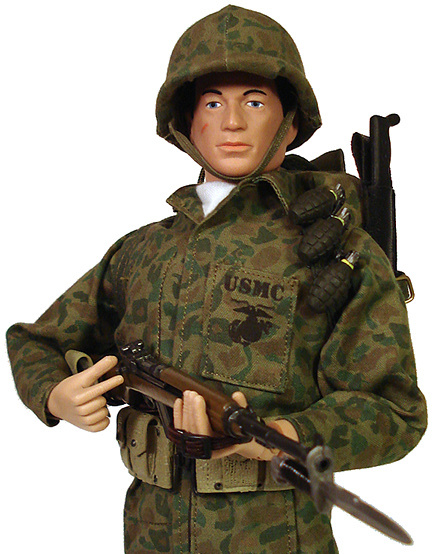 All GI Joe and action figure collectors are welcome and admission is just $5.00 per person at the door. Family admission will be $10.00. Boy Scouts in uniform, Military, Police, Firemen and other Law Enforcement Personnel will be allowed in FREE with a current and valid ID. For all of the up-to-date information check out the DFW GI Joe and Action Figure Show Facebook page. Bottom Line: This is a “Must See Show” for all GIjOE and action figure fans. 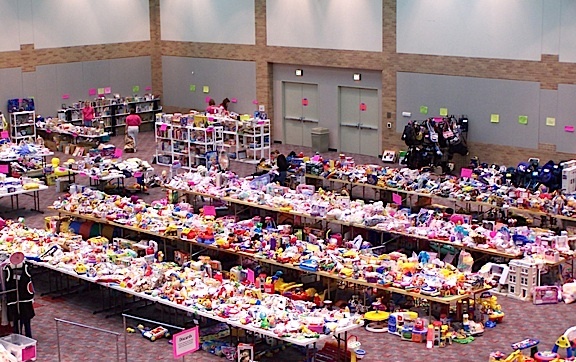 And with a bigger hall, more dealers, and more collectors attending, it’s bound to be even MORE fun than last year’s event! So mark your calendar now—and don’t miss it!